You are here: Home / A Talking Cat / You Ain’t No Good, See!?! You Ain’t No Good, See!?! Pop quiz, hotshot. Name the Humphrey Bogart movie this quote is from. You ain’t no good, see? You know, I hate to do this to you but I might have to fill you full of lead, see? A man’s gotta do what a man’s got to do. If your answer is “none of them,” you are correct! But that doesn’t stop Phil from “quoting” it to Duffy, who is just as embarrassed by Phil’s acting as the audience. If you’ll recall, horrible terrible mother Susan was talking about the Humphrey Bogart movie marathon in the previous scene. Normally a scriptwriter might put a few scenes in between the talking about something and the doing of something. It makes the audience feel smarter for remembering the thing that was said. The audience’s brains get to make a connection which gives them a little shot of feel-good juice. If you don’t allow for that space, it’s just one long mess that doesn’t end. But what were you expecting from A Talking Cat!?! Phil is fine letting a strange cat lay on his bed. That’s probably because Phil already has ear mites, so what does he have to lose? Nobody in this movie seems concerned with finding Duffy’s real owner. Surely one of the FOUR TAGS HANGING AROUND HIS NECK has an address on it. One says Duffy, one looks like a house, one looks like a bell, and one…holy crap. Hold on, you assholes. Check this out. 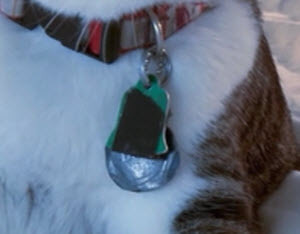 There’s black tape over Duffy’s bell-shaped tag. This cat is so horrible that they couldn’t even remove his identifier tags for fear he’d run away and get lost. Every time I think I’ve found everything wrong with A Talking Cat!? !, I find something new. Moving on to the meat of the scene (black tape? really? ), Phil asks Duffy for advice. Duffy complies by opening his godless terror chamber of a mouth and telling Phil to take a long walk in the woods. Phil thinks this is a good idea until he decides it’s time to take a stab at getting himself an Academy Award. 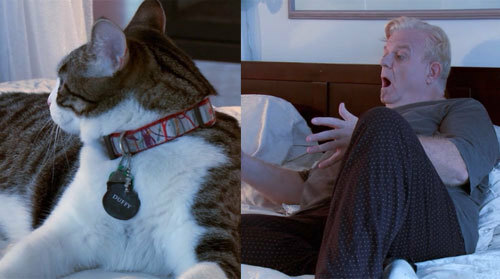 To his credit, Phil is the only one who acts appropriately freaked out that a cat is talking to him. Too freaked out? Yes. Duffy, the talking cat, uses his magical “can only talk once” abilities to repeat that Phil needs to take a walk in the woods. Hearing this joyful noise, Phil leaps out of bed to spread the good news! Actually, he leaps out of bed to frantically yet very very slowly get Chris. This takes about 30 seconds. Boy oh boy, Chris hates his dad! As Phil tries to explain that Duffy talked to him, Chris rolls his eyes at least three times. Wow, it’s really great to watch two acting heavyweights in the same scene together. I wonder which one of them will take home that Academy Award. It’ll be a tough decision. And here is the just described scene, with Duffy’s dialogue taken out. Enjoy A Talking Cat!?! Minus A Talking Cat!? !